Cal-IPC defines invasive plants as: plants that are not native to an environment, and once introduced, they establish, quickly reproduce and spread, and cause harm to the environment, economy, or human health. The Inventory categorizes these plants according to the definitions below. Plants were evaluated only if they invade California wildlands with native habitat values. The Inventory does not include plants found solely in areas of human-caused disturbance such as roadsides and cultivated agricultural fields. Wildlands are public and private lands that support native ecosystems, including some working landscapes such as grazed rangeland and active timberland. Non-native plants are species introduced to California after European contact and as a direct or indirect result of human activity. Invasive non-native plants that threaten wildlands are plants that 1) are not native to, yet can spread into, wildland ecosystems, and that also 2) displace native species, hybridize with native species, alter biological communities, or alter ecosystem processes. Invasive plants crowd out crops and rangeland forage. These invaders can be low in nutrition or even toxic to livestock. Invasion can cause land values to drop, and management is often costly. Nationwide, invasive weeds in pastures and farmland cost an estimated $33 billion per year. Invasive plants can blanket waterways, trails, and scenic landscapes, making boating, hiking and biking difficult, and lowering the land’s value for photography and wildlife viewing. Invasive plants can significantly degrade wildlife habitat. Nationally, invasive species are the second-greatest threat to endangered species, after habitat destruction. Invasive plants reduce habitat for game species. This stress on wildlife reduces hunting and fishing resources. 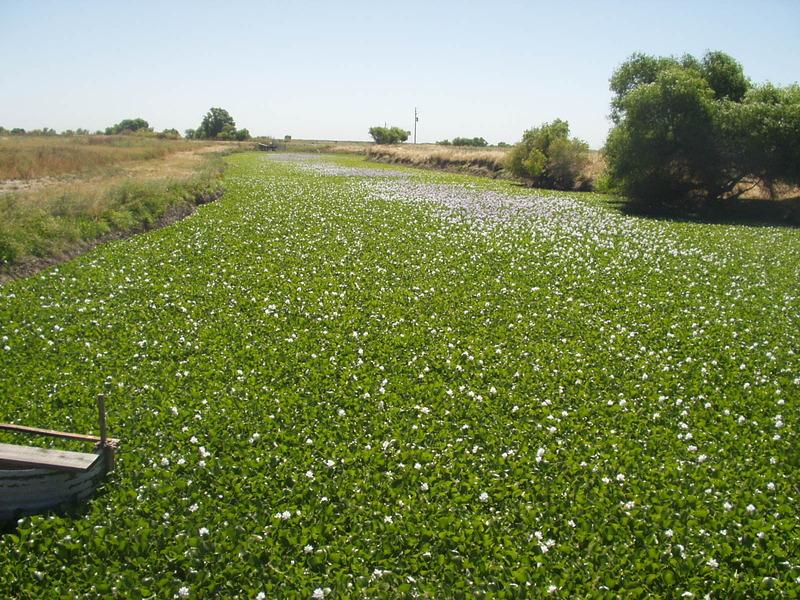 Invasive aquatic plants form dense mats that restrict boat access and kill fish by reducing oxygen in the water. Invasive ornamentals such as Scotch broom, pampasgrass, and eucalyptus increase fire fuel loads and are dangerous near homes. Plants like giant reed (Arundo donax) clog creeks throughout California, reducing their water-carrying capacity and increasing the danger of floods during winter storms. Some invasive plants generate higher fuel loads than native plants. When these plants invade, wildfires can be more frequent and sometimes catastrophic. Towns and wildlands may need decades to recover from these dangerous, costly fires. Some invasive plants consume enormous quantities of water. This water is lost to wildlife, agriculture, and drinking supply, at a high price. And controlling invasive species is a top recommendation of climate resiliency plans.